Is Solinas the man for the Chiefs job? You are here: Home ∼ Is Solinas the man for the Chiefs job? 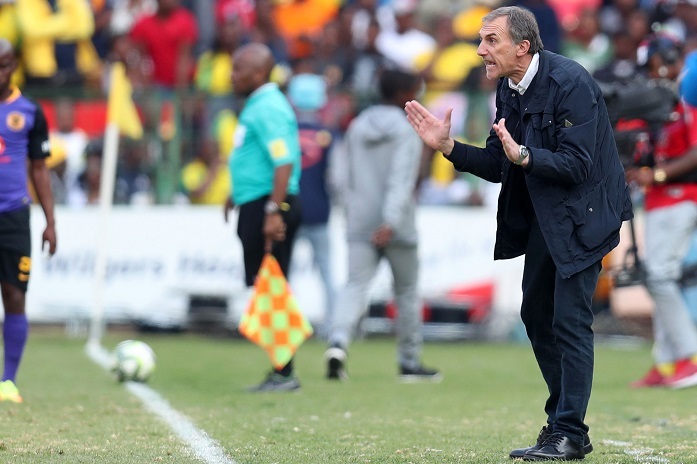 After defeat in the Telkom Knockout semi-finals at the hands of arch-rivals Orlando Pirates, Kaizer Chiefs coach Giovanni Solinas is skating on thin ice at Naturena, writes DEAN WORKMAN. The defeat to Milutin Sredojevic’s side was their second Soweto derby loss in as many months, which is a hard pill to swallow for the Amakhosi faithful, considering the result saw Chiefs set a record for the longest winless streak by any side in Soweto derby history, 11 games! Not that long ago, Orlando Pirates were the brunt of many jokes after a number of poor seasons where they chopped and changed their coaches in an attempt to end a barren trophy spell. They might not have won a trophy since 2014, but have now settled on the duo of Sredojevic and his assistant Rulani Mokwena, and Chiefs fans have had to watch as their neighbours began improving steadily, turning into genuine contenders across all competitions this season. At Naturena, on the other hand, things have not gone so well since they last won- silverware in the 2014/15 season under Stuart Baxter. The now-Bafana Bafana coach was replaced by Steve Komphela, who had close to three seasons at the club, yet failed to win a single piece of silverware. Komphela’s now infamous exit, and the scenes that accompanied it, were undoubtedly fresh in the mind of the Chiefs hierarchy when they started their search for a new coach. Chiefs general manager Bobby Motaung struggled to find a suitable replacement, despite having ample time to do so, and admitted as much during the buildup to the 2018/19 campaign. Motaung finally settled on former Free State Stars boss Solinas, who missed a large part of the pre-season preparations, leaving the Italian with little time to impart his ideas to the players before the season started. Chiefs announced the high-profile signings of Khama Billiat and Lebogang Manyama, but despite these quality additions, Solinas struggled to hit the ground running. After failing to win any of his first six games, the Italian eventually started to find his feet as his side went on a winning run that won him the Coach of the Month award for September. This, however, proved to be a false dawn, as they have since gone on to lose twice to Pirates, first in the league which saw them slip further away from the leaders, and then in the Telkom Knockout semi-finals, a result which will see their trophy drought extend a while longer. A decision now faces the powers that be at the Soweto giants, with questions seriously being asked about Solina’s ability to take this Chiefs side back to the summit of South African football, all while former coach Mushin Ertugral is now without a job following his resignation from Ajax Cape Town. Ertugral had two spells at Chiefs, the first back in 1999/2000, which included a victory in the 2001 African Cup Winners’ Cup, to date the club’s only continental trophy. The most recent spell was back in 2007 to 2009, where he won the Telkom Knockout and MTN8 with the Glamour Boys. If Chiefs do wish to act, now will be the time as they face a very difficult run in December and January when they play SuperSport United, Bidvest Wits and Mamelodi Sundowns, all while trying to balance their continental commitments. If the Glamour Boys stick with Solinas through this run and it does not go according to plan, they could find themselves way off the pace in the league and staring at possibly another trophyless campaign. Solinas’ axing and Ertugral’s appointment may be short-term and one out of necessity and convenience, but it would be a move that will see Chiefs playing with a clear game plan and identity. With the defeat of Saturday’s TKO derby loss still fresh in the minds, the ball is in Motaung’s court. He has one big decision on his hands.